"Class with Jane is always full of new ideas and imaginative challenges. She shows us the techniques of painting, layering, using gels and collage, and the principles of design. It’s inspirational—and fun." Have you looked at your painting and wondered where to go next? Do you stare at it and think, hmmm, what is it that I need? Fun-D-Mental Cre8tivity can help! Are you struggling to find where to start the creative process and want to dive in but are not sure what to do? As a self-taught artist do you struggle to find the right information to help you learn how to paint a work that you are happy with? Sign up today! How do I start and what do I need? Where do you start? What are the tools I need? Show me your stuff! I will provide you a full list of the tools that I use and why they are important. We will review a couple of the artists that will be critical in the first several classes. By sharing your work in the group we learn where everyone is in their creative journey and where you are starting from. Color and value and how they go hand in hand. Color and Value. Does your painting look flat? When you are working on a piece do all of the colors get muddy? Do you look at the color wheel and understand it some but you are not confident in mixing your colors? Color and value are two of the strongest components of a painting. Color is what grabs you first when you look at a painting but the value changes are what really make the painting come to life. We will work on palette development and go over tools to use to help you better determine values in your piece. Have you ever heard about making a path that carries you into a painting and wondered what that was? Does your eye stop at one spot in the painting or does it bounce all over? Does a color over power your painting and you don’t know how to fix it? In this lesson we will talk about using line to carry your eye through the painting. We will talk about the use of various types of line and how they can impact what you are working on. We will also talk about the Rule of Three and how that helps you allow the viewer to look at a painting and be carried around the painting from one place to the next. Two live calls to discuss the element that will be covered that month. Each element such as line, color, balance will be discussed and exercises will be assigned once a week. Live Facebook chat and Facebook group for the class. Lesson plan with additional information and examples provided. Discussion of various techniques that will help with each element and how to incorporate it into your work. Two one-on-one calls to review your work and your progress. Need another round of coaching? A discount is available for repeat clients. *Prices will increase on Nov. 1, 2018. Book now at this Early Bird rate! "Taking a class from Jane is a creative adventure. She encourages her students to develop their artistic vision by exposing them to new techniques and exemplary works by a range of artists, as well as by providing frequent hands-on demonstrations. Equally important, the atmosphere in her class is relaxed and just plain fun!" I love art and I am passionate about painting! No matter if you want to paint in oil or acrylics, I have done it. As a full time artist with over 50 years of experience as an artist and teacher at the Workhouse Arts Center I want to help my students build a strong platform that will guide them in creating their best art ever! I have coached artists and worked with students to help them find their voice and I can help you. I received a Bachelor of Fine Art with a concentration in painting and drawing plus a strong background in art history. I also took classes from leading artists at the Art League in Alexandria, VA for over 20 years where I studied oil painting, mixed media, and abstract painting. I have had illustrations in newspapers, cookbooks, organization periodicals, and a children’s workbook. My paintings have won a number of awards and my geisha series was selected for a very successful solo show at the Art League in Alexandria, VA. Twelve of my paintings are part of the permanent collection at Children’s National Medical Center. Why should you learn the Fundamentals? The fundamentals of art help a painter understand how to start and finish a painting with confidence. With knowledge of the principles design, the elements of art, and composition an artist can take bigger steps towards finding their own creative voice. My online class is packed with information! I want my students to have all the tools and information to help them understand how to paint! Not only do I teach the elements and principles that are key to any painting but I also give a student a lot of art history and direct students to artists who are prime examples of creators who used the different aspects that I am teaching. On top of that I know a boat load of technical tools to help you! Whatever style you paint in it does not matter as I provide you with the information to understand the foundation of painting. With the foundations of art as the underpinning of your work you will be able to build paintings that are eye catching and strong! This is not just about the creative process but so much more that will help you understand art over all. 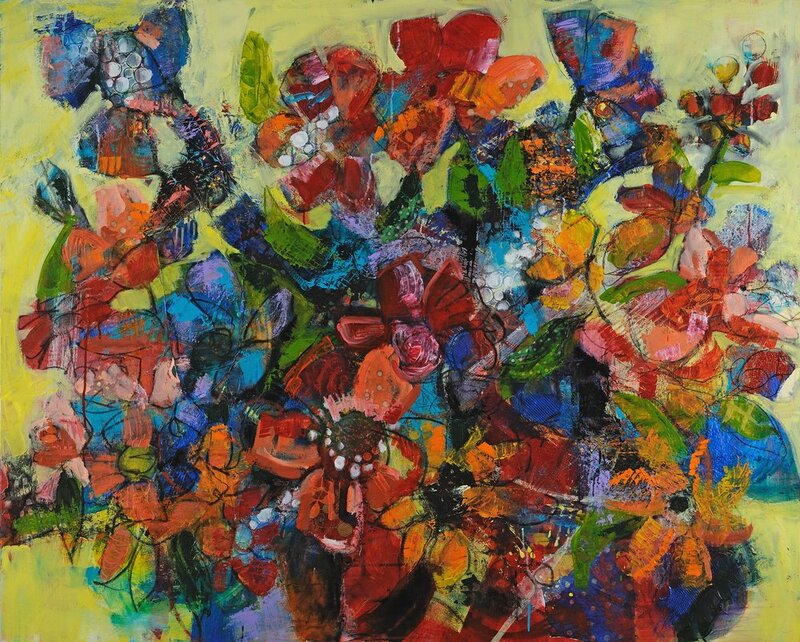 Jane Johnson offers students a jump into the world of bold, abstract mixed media. She is a skilled painter with a strong eye for color. As a student, I was looking for more depth and texture in my art. Jane offers fabulous texture building solutions along with the skills that helped me bring balance to my paintings. This painting, “Sweet Dreams” came to life in my second session with Jane. The original canvas was black and soon, layers of paints, textures papers, paint skins, and drawing media helped this painting blossom. So happy with the outcome! Two assignments a month with an introduction and explanation video workshop given through my virtual classroom on Zoom, which is very easy to use, even if you aren't too good with tech tools. Zoom calls are recorded so if you miss them you will have a link to view them later. Live discussions on Facebook in a private Facebook group. Are you an experienced artist who wants to find their voice? I offer private coaching to help you develop your creative voice and to have another pair of eyes on your work to help you see what you might need to focus on. Can I get my money back? As this is a monthly subscription you can drop the class at any time you want and don’t renew for the next class. All billing will be handled through PayPal, no checks or credit cards. Any questions on an assignment, send me a FB private message and I will respond within 24 hours or sooner. I am here to help you and support your growth as an artist.